Overview: From the distant Nordic lands, set sail with the Vikings in search of riches, west across the unforgiving sea. Join Ragnar, Hela and Rollo on their epic voyage and help them seize glorious plunder in this epic 5-reel, 40-line slot! Pray to the Norse gods and seek their favor and conquer your fears as you spin the reels on Vikingdom, there are no rewards for the weak. Ragnar is a Double High Wild with x2 Multiplier which doubles the win when substituted with all other symbols (except scatter). 3 or more of the Helga symbols will trigger the fantastic free spins feature that is filled with more ways to increase your plunder. During the Free Spins feature, all wins are doubled, and the Double High Wild is replaced by an Expanding Wild with a x2 Multiplier. The chances of great rewards during the free spins feature are further increased with an additional Random Wild with x2 Multiplier. 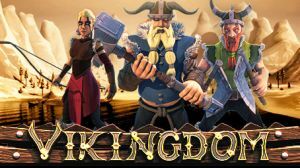 Plunder your way to glorious wealth in Vikingdom! Similar Slots: If you like Vikingdom, you might like these other slot machines from Saucify: Age of Spartans, Legends of Avalon - Progressive, Monkey Business, Rising Sun, Royal Banquet.